Food Hub is very popular in the Nashik hospitality circuit due to its close proximity to a number of important landmarks. The hotel is located on the National Highway 3 near Jain Santhi Dham in Nashik. The rooms are very spacious and have been painted in neutral hues. The rooms are well-lit and have been provided with large windows which allow the guests to enjoy a lot of sunlight and fresh air. A set of sturdy wooden chairs have also been provided throughout the room. The windows allow a lot of fresh air, bright sunlight, and some amazing views to the guests. All windows have been provided with grills. The extra facilities provided by the hotel which further enhance the stay experience are free Wi-Fi, laundry provisions, CCTV cameras, a mini-fridge in each room, card payment in all forms, an uninterrupted power backup source, and parking provisions. The in-house facilities include a kitchen, an in-house restaurant, a conference room, and a common dining area which can be used by the guests to relax and rejuvenate after a tough day at work. 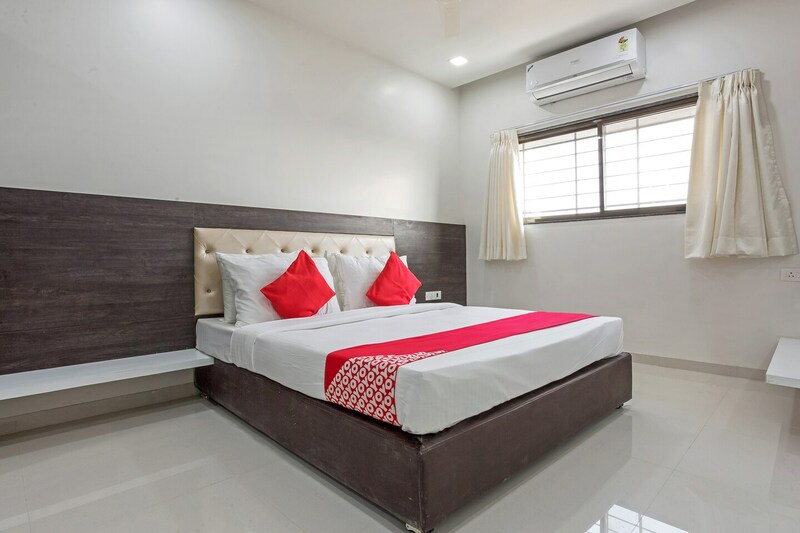 The hotel is surrounded by a number of essential facilities such as Sai Temple, Manu Devi Temple on the Ozer Road, Ganesh Temple, Anusaya Warehousing Complex, Shree Hanuman Temple, and Mercury Winery Private.